Of late the pattern seems have been that sunny days turn cool and cloudy round about tea time. 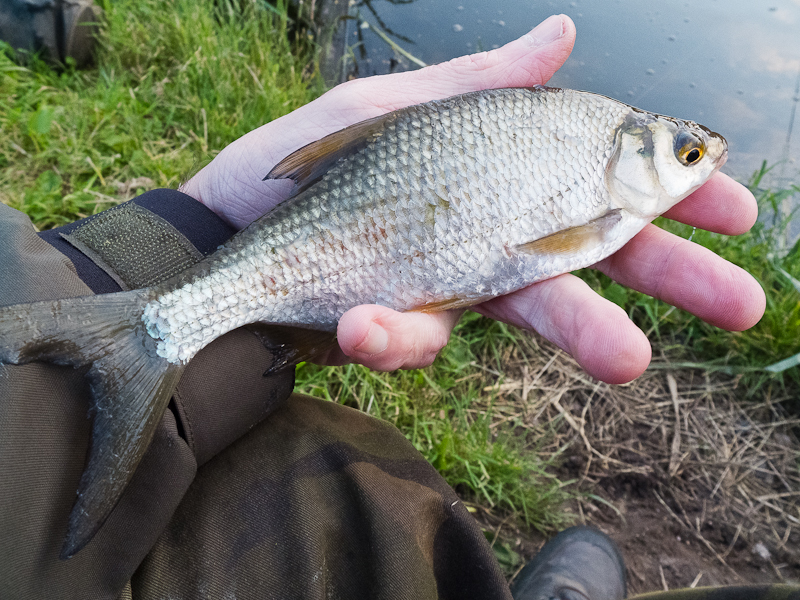 I should have realised this and done my bait snatching during the day when the small fish are active in the surface layers. At least then I might have had a chance of success. As it was the sun was obscured by the time I set up around six on Saturday. Worse still there was a cool breeze blowing in my face as I sat there wrapped up as if it were October. Bites were few and far between. I managed on bait sized fish and another that was too big before I packed in. I tried another spot, got a perfectly sized roach second chuck, then nothing. I'd lasted all of two hours. I couldn't even face putting the eel rods out. Like a fool I started late again on Sunday. Again the sun had done its disappearing trick. I looked at one spot only to find a canal cruiser moored in the swim I had in mind. The second spot was weeded up from my last session there and by the time I got back to the car rain was falling. What was propped up in the garage? The umbrella. I drove to another water to see if that looked worth a chuck for a few small fish. I wasn't inspired. Where next? home James, and don't spare the horses. On the way back home my mood changed. The rain had stopped and the sky looked a little brighter. I called in for a look at another place. After a walk to check a couple of spots I got the gear out and set off. Why I picked the swim I did I have no idea. It was a bad move. The wind was straight in my face and cold. The float rod was in action, but the float didn't do much. Then it rained. Not much, and not for long. I started to get tentative bites. Just as I did a mistle thrush alighted in a dead looking oak, accompanied by a family of whitethroat. The thrush flew into a tangled old blackthorn and began to sing. The sun peeped through the clouds but failed to look warm. The float sank and I connected with a hybrid. Too big for eel bait it went back. Time was getting on and I was getting cold. Two pegs away it felt an overcoat warmer. There was some shelter from the wind there so I moved. The rain had passed over and there was a feeble attempt at a sunset as I set the eel rods up. Still short of bait I put a couple of worms out to the right and cast a roach tail to my left. Or tried to. The braid had caught in the spool's line clip and the cast stopped with a jerk, sending the bait flying off the hook. Not a good start when you are short of bait. I put the head section on the hook. Almost straight away the worms were under attack. It wasn't long before twitches started on the deadbait rod either. Some ended up with a dropped bait, others I struck at and missed. Eventually I connected with what felt like a small eel. It fell off in the edge. I tried fishing straight off the baitrunner to no avail. I fed line off an open spool. This didn't work at first, but eventually one take kept going and I hooked an eel. The smallest so far on a deadbait. 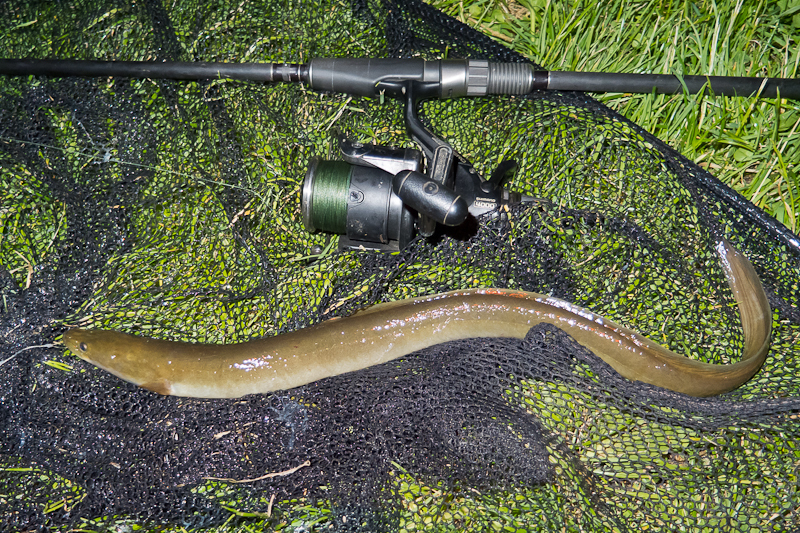 This little eel tends to confirm my suspicions that most of the tentative takes and twitches have been coming from fish of this sort of size. It's the possibility that larger eels are also giving takes like the small ones that makes it frustrating. Wait for the run to develop or try and hit everything? It's a quandary all right. I packed the gear away feeling quite warm as the wind had dropped. Arriving home I unloaded the car. With the landing net hung up to dry I opened up my rucksack and removed my jacket which I had crammed in on top of everything else. A shower of red and white maggots flew through the air. 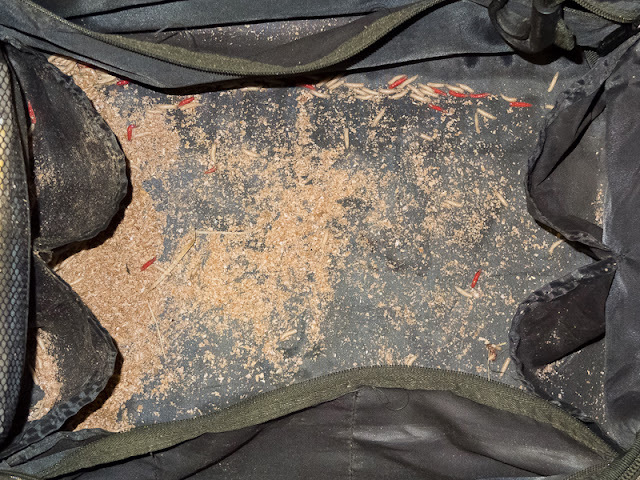 The lid had come off the bait tub and they were all over the inside of the rucksack! Maggots love to crawl into dark nooks and crannies, and the Korum Ruckbag is full of nooks and crannies. I found nooks and crannies I didn't know it had as I tried to rid it of the infestation. I'm pretty sure I've cleared the maggots from all the obvious places, but the bag's stopping in the garage until the few I haven't winkled out turn into flies.